US, 1968, 95 minutes, Colour. Patrick O' Neal, Joan Hackett, Herbert Lom, John Gielgud, Eric Portman, Oscar Homolka. 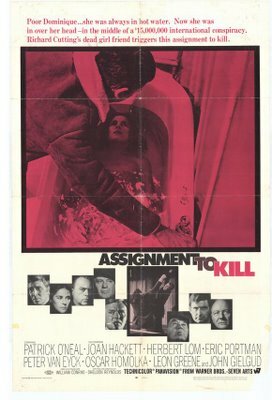 Assignment To Kill is an interesting thriller, not as good as it might have been with such production values, European locations, star-studded cast. It has the thriller conventions but it also tries to say something about the private detective and his moral stance towards the world. It also tries to say something about social injustice. An entertaining, if ordinary, thriller. 1. The title, thriller conventions, the atmosphere of crime, the private eye, heroes and heroines, suspense and violent situations, resolution? Was this film ordinary, more than ordinary? 2. The production values: Panavision, colour, European locations, music, style? 3. Cutting as hero: his personality, laconic, violent, a killer, in comparison with matt Wilson and the nature of the comparisons made throughout the film, his being hired, his techniques and the illustration of his skill and real understanding of criminal mentalities? His discovery of Dominique, relationship with her, sexuality, attachment, love, protection? His avenging her? The importance of his hounding Wilson? Of Cutting's bluffing of Valayan? A personality, a type? The pros and cons? A man of the 20th. century world? 4. The basic situation and the social comment: the sabotage of the ships, the deaths of the men, the plane, the amount of money invested, the small countries involved and corruption, politicians being bought, lack of scruple and ruthlessness, the violence, Valayan and others being outside the law? The film's critique of this world? Especially through Dominique? 5. The focus on Green and the initial suspense in the search for him by Cutting, by Wilson? Dominique and the revelation of the truth about Green? His guilt, the issues and Dominique's involvement? The picturing of his death? The consequences for all the characters? 6. How attractive a heroine was Dominique? American background, helping Green? Type, attitudes, sexuality, love for Cutting? How shocked was she by events and people's attitudes? Her bluffing, wanting the truth to come out? The savagery of her death? 7. The portrait of Wilson as an unscrupulous criminal? The brutality of his henchman and his following Cutting and Cutting's outwitting him? The revenge in Dominique's death? Wilson as clever, an ugly criminal? His death? 8. The subtle picture of corruption in the notary’s agreeing to sign the document? His wanting to get the blame onto someone else and get the money? 9. A contrast with the police and the quiet way of doing their job even though their hands were so often tied? The end with the police? 11. An exciting thriller? What taste in the mouth did it leave as it made comments on contemporary social situations?